I just finalized my DScalerScheduler Project. Instead of using different modules as before there are now only 2 applications. Just put the DScalerScheduler-folder into your TvBrowser-folder like on the picture above. In TvBrowser just set the scheduler.exe for your Capture-Plugin. Than set these parameters for recording. Set up the external channel assignments according to your channel layout in DScaler and thats it. 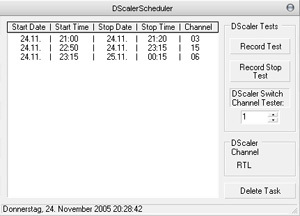 The DScalerScheduler looks like this. I’ve added some extra buttons in order to test the initial functions with DScaler, so you wont have to wait for the first record to see if it works at all. And as before you can minimize the application to tray by double-clicking on the tray-icon. It works with the new DScaler 4.1.14 and .Net Framework 1.1 . Comments and reports are welcome. I tried DScaler 4.1.15 and there is a new limitation. Somehow things changed in 4.1.15. Don’t ask me why and how. But now you have to Toggle Menu to visible. Its not possible to pass any other keys than [0–9] to DScaler with WM_CHAR. So I can’t implement the new key combos Shift+R and Shift+S. Just for the info: DScaler is not meant to be a recording program for TV shows. Thats what they told me in their forums, so there won’t be any further support from them. So we have to deal with the problems and limitations. Well, and about that remote launch of DScaler.exe … I don’t like it myself when apps start out of nowhere while playing games or watching dvds and so on, same with hibernate and shutdown. There are endless tools around the internet to do that functions and lots of people use em everyday (Shutdown Timer v1.0.3, Shutdown4U 3.6, and so on). This entry was posted on Thursday, December 1st, 2005 at 2:20 am	and is filed under windows. You can follow any responses to this entry through the RSS 2.0 feed. You can leave a response, or trackback from your own site. Welche Parameter muß ich für die Löschfunktion im TVBrowser Plugin angeben? Is there any plan to program a GUI to control this ‘schedule.txt’: task manager with editing functions? Jaune the Windows Tasks were too buggy for me in practice. I may add a few options from wizmo ( http://www.grc.com/wizmo/wizmo.htm ) for shutdown and hibernate but usually my recording machine runs 24/7 so I don’t need that functions myself. So use SendMessage/PostMessage instead. Every menu option has a corresponding message that can be sent from an external program. It’s how I use uICE or Girder to control the display of the program guide information. The beauty of it is that it doesn’t require giving focus to DScaler. are enormous (about 50G for about 2hr.) Any suggestions? Thanks thanks thanks thanks thanks thanks thanks thanks thanks thanks thanks thanks thanks! Get the top find a manufacturer in china now in stock on the market and at great prices…. See here for the best china product sourcing now available around plus at great prices…. Get the best keyword selection now available around plus at the best price…..